Several years after a boating accident claims the lives of her parents, Angela (Felissa Rose) is sent by her aunt Martha (Desiree Gould) to summer camp, Arawak, along with her cousin, Ricky (Jonathan Tierston). At the camp, Angela’s awkwardness makes her a target for bullying from both the boys and the girls. An unseen killer begins to dispatch the kids who make Angela’s life miserable. Meanwhile, she begins to develop a relationship with a boy named Paul (Christopher Collet). Ricky starts taking the blame for deaths around the camp, while Angela takes Paul out to the lake to reveal a secret she’s been keeping from everyone. 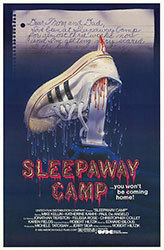 By 1983, the slasher genre was fairly rote and Sleepaway Camp is a great example of how to throw in just enough variation to keep things interesting while still sticking to a fairly rigid formula. The plot of the film is predicated on some questionable gender and sexual politics, but slasher films have never been shy about exploiting these things. The various ways in which characters are killed are by turns humorous and increasingly gruesome. It contains, as far as I know, the only beehive related killing in slasher film history. The acting is in general competent, except perhaps Desriee Gould’s turn as Martha, which is so over the top, I’m still not sure if it’s deliberate or not. Much has been made about the final image of this film, and it is indeed a haunting and bizarre moment that seals Sleepaway Camp as an essential slasher film.